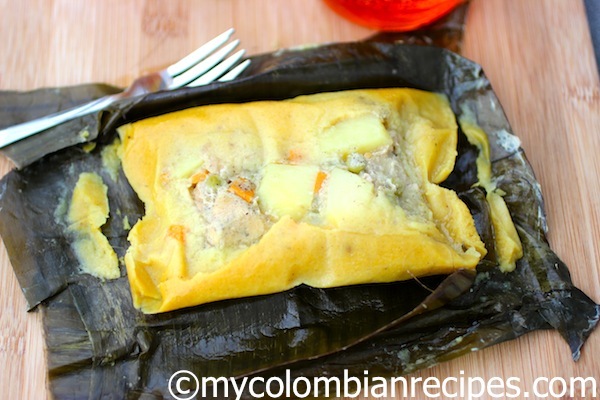 There are many variations of tamales in Colombia, but they all have something in common and that is that Colombian Tamales (Tamales Colombianos) are all wrapped in banana leaves. I am going to post many types of tamales recipes in my blog but to start let me introduce you the Tamales Antioqueños, from the region Antioquia, my hometown. This tamales recipe is my mom’s and they are delicious. Nobody makes them as good as my mother, but these came pretty close :). It is a tradition in my family to make these tamales for Noche Buena, our traditional Christmas Eve celebration, although we eat them year round as well. Some Colombia tamales variations are: tamales tolimenses, tamales Vallunos, tamales de pescado, tamales de pipian, tamales de Nariño, tamales Santandereanos and there are more. One of the secrets for making good tamales is to marinade the meat overnight. Place all the marinade ingredients in the blender and blend until smooth. Reserve ½ cup of the marinade to prepare the masa. In a large plastic bowl place all the meat, add 1 ½ cups of the marinade. Mix well, cover and refrigerate overnight. To prepare the masa: Place the masarepa in a large bowl, add the water, salt, sazon Goya or color and reserved marinade. Mix well with a wooden spoon or your hands. Wash the leaves well with hot water and set aside. To assemble the tamales: Place 1 piece of the leaf on a work surface and place a second leaf on top, pointing in the opposite direction, like forming a cross. Spread ¾ cup of masa in the center of the banana leaves, at the point where they connect and form a cross. Place 1 piece of pork, 1 piece pork belly and 1 piece of rib on top of the masa and place about 1 tablespoon of peas, 1 tablespoon of carrots and 2 tablespoons of potatoes on top of the meat. Fold the banana leaves up, one of the four sides at the time, so that the leaves enclose all of the filling, like you’re making a package. Tie with butcher’s string. Continue the process until all the tamales are wrapped and tied. Bring a large pot with salted water to a boil. Add the tamales and then reduce the heat to low. Cover and cook for 1 hour and 45 minutes. Remove the tamales from the pot and let them sit for about 5 minutes before serving. Cut the stirring and serve in the leaves. Serve hogao on the side if desired. How did you know I was craving tamales? Its like you read my mind. Now I must find a way to get some delicious fixings pronto! Oh My, that looks as good as the name makes it sound…. vat a great idea!! I have been wanting to try to make tamales for quite some time. They are always featured in magazines and Food TV shows this time of year. Though I do have two questions for you. 1) I have a large amount of Masa Harina (white precooked cornmeal) and was wondering if this is what is also used in some recipes for tamales, no? And 2) Do you use the rib bone and all in the actual tamale filling here? I will definately have to try this very soon. Looks delectable. 1. I know that people use masa harina to make Mexican tamales. The one we use for Colombian tamales is precooked corn meal, the one to make Colombian and Venezuelan arepas and Colombian empanadas. 2. yes, I use the small bone-in pork ribs. Erica, The more I read your columbian recipes, the more I am struck by its similarity to bengali food. Banana leaf wrapping is a delicacy in west bengal too. A place where I come from. I always adorde thecolor ‘ hot Tamale’. Now I know where its comes from! Its gorgeous, Maybe a substitution with chicken breasts might work? given that I don’t eat meat? 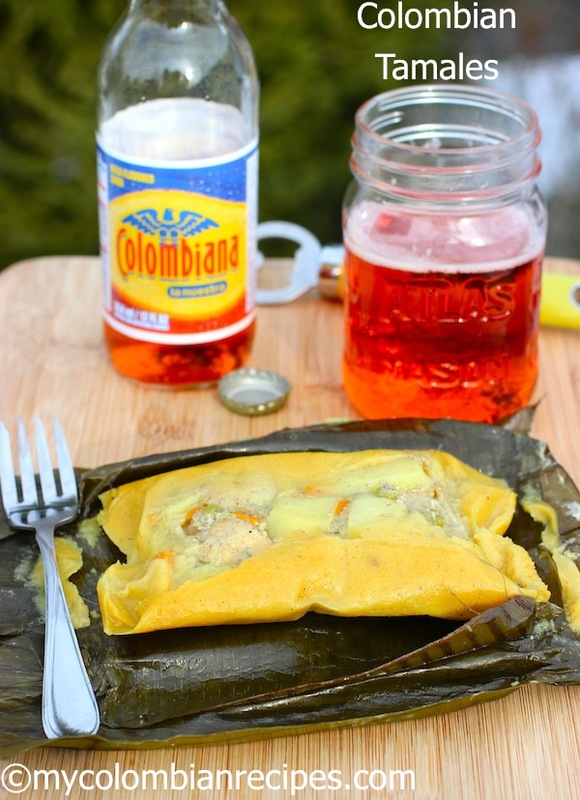 yes, we have chicken tamales in Colombia too and they are very popular too. Colombian Jhonny, C O L O M B I A N. Not Columbian please! I didn’t know all these tamales variants, for sure all are so yummy I need to try this recipe soon. 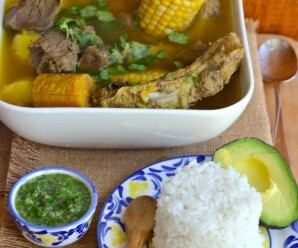 Te felicito a Ti y a tu Mama por esta receta! I like tamales, but to be very honest with you I don’t think I want to make it at home…too complicated, but would not mind to eat it…it was nice to see you making them step-by-step…nice pictures. The tamales look delicious 🙂 By the way, thanl you for visiting my blogs. Amazing Erica! These look like our Chinese zongzi. I bet they must be so yummilicious! 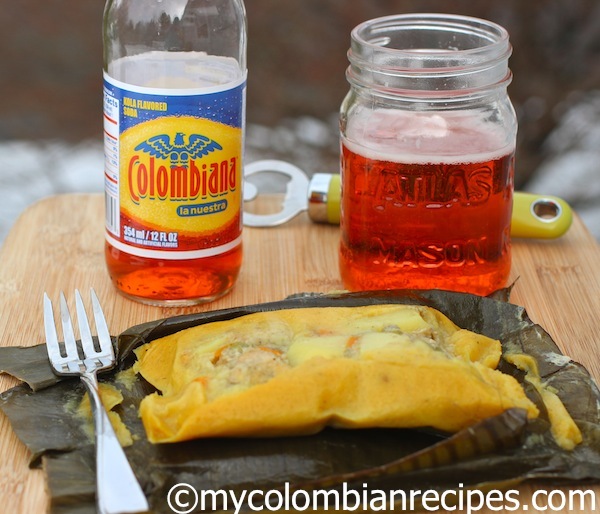 These sound great, and I love the idea of tamales in banana leaves! I am so looking forward to the whole of your tamale series! This is something I know so little about! oh wow wow your blog is always making me hungry!! Never heard tamales before. Looks scrumptious! And wrapping it in banana leaves is so interesting. I adore people’s creativity in making dishes unique. These tamales look outstanding! Thanks for sharing your mom’s recipe! So basically I can do this simply substituting chicken breast for the pork…right? Jhonny- Yes, you are right, but I prefer bone-in chicken for flavor. Erica, I’ve been meaning to check these out! They are beautiful! I like how the colombian version uses cornmeal instead of masa harina without the use of lard. I’m going to have to try these this year as my family always eats tamales on Christmas Eve as well! Lovely!!! Qué bueno haber encontrado esta receta. Erica, cuántas hojas de plátano se necesitan para hacer un tamal? Donde vivo son carisímas, 1.20 euros la hoja y no se cuántas necesitaría por tamal o si las puedo reemplazar por algo más. Otra paisa- Gracias por tu comentario. La verdad es que las hojas son las que le dan un sabor especial al tamal. En USA yo conpro las hojas cortadas en paquetes, entonces no se cuantas hojas exactamente me gasto. Yo normalmente hago de 12 a 15 tamales con 2 lb de hojas. En Colombia se compran las hojas frescas y es differente. Esperemos que alguien que lea este comentario te pueda ayudar mas. 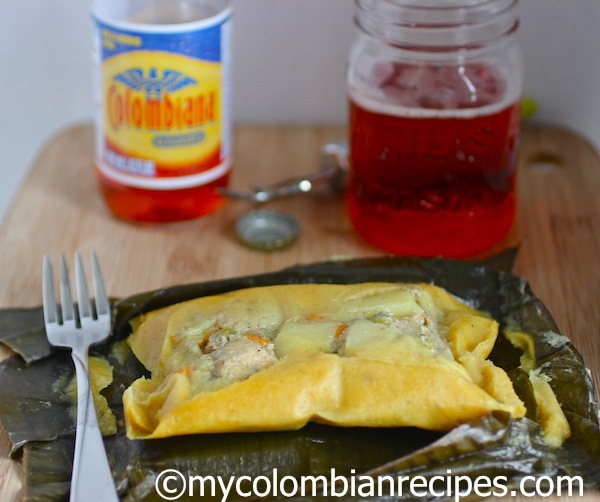 Gracias por compartir tu receta…que suerte haber dado con tu pagina.. mi esposo es de medellin y quiero hacerle estos tamales para la cena de navidad… espero que me salgan igual que los tuyos! se ven riquisimos. Hi! I lwas wondering if I could use chicken instead of the pork? Thanks! Que rico tamal me entojo.. ahora quierooooooooooo………………. HOLA OTRA PAISA COMO ESTAS?? Soy Paisa, pero vivo en Australia…..
La paisa-Yo vivo en Estados Unidos. Arepa flour: Also called masarepa, harina precocida, or masa al instante, this is made from finely ground, precooked corn and used to prepare dumplings and fritters in addition to arepas. You can find it in most Hispanic markets and on the Latin/ethnic-food aisle of some supermarkets. Be sure not to substitute the easier-to-find masa harina, a Mexican product used to make tortillas and tamales―your arepas won’t taste quite right. Good point Rosita , because that’s probably what I would of bought, the Mexican one. I’m from Bogota but live in northern new jersey. I was wondering where you get the hojas de platano, I would love to make tamales!!! Carol- You can I buy them frozen at a Latin or Asian market. These tamales look sooo good!!! I just have a question. On the last step when you boil the tamales, how much water do I need? Do they need to be covered in water? If the water evaporates do I add more? Thanks!! I love your Blog. My husband is Colombian and I’ve been looking to recipes. I love your blog! I made the arroz con pollo and he loved it. I want to try to make the tamales. But I have a question. How much water do I need to cook them? Do I put the tamales totally under water to where they are covered with water? Sonia, the tamales should not be boiled. They must be steamed. Make sure you don’t submerge them in water, otherwise you’ll have a big mess. The best way to steam them is in a large stock pot. This is rather rudimentary method but it really works well. Fill the pot about 5 inches with water. Place three rocks on the bottom, and one of those metalic steam baskets that you can get at any supermarket on the rocks. Start layering the tamales on the steamer in order to allow thhe steam to reach them all. Because steaming should be no less than an hour and a half, you have to constantly check the water level and continue adding boiling water to replace what you lost. Good luck. Erica has done a great job with this recipe. I made tamales for Christmas. I added chicken and pieces of veal to them (along with the pork) and came out great. The wrapping with the leaves was difficult -I used way more than 1 lb.-, but I ended up double wrapping the tamal (already in the leaves) with plastic coated freezer paper so that no water would go inside, and it worked! The tamales were a hit! Thanks for your wonderful recipes…Have a happy New Year! Erica, thank you for the receipe. I made about a dozen tamales following your receipe, however they came out as hard as a brick, what did I do wrong? Somebody said I was to put CALABAZA in then to keep them soft, If this is so, what is CALABAZA and were do i find it in US. Jal- We don’t put calabaza in this recipe!!! I make these tamales all the time and they are moist and delicious! did you overcooked them? Well, maybe I did, overcooked them,although I don’t know how I did that but, I will try them again. Thanks for your quick response. To avoid the harness my mother put a good amount of vegetable oil in the dough and her tamlaes are spectacular. ALso, the precooked corn meal brand also makes a big difference, my mom likes Harinapan that is made in VEnezuela…but any Harinapan is good. We are from the Colombia Atlantic coas and our are really delicious. me llena de gran alegría encontrar este rincón de delicias colombianas. Aunque soy de Colombia veo varias preparaciones que no conocía y que haré. muchas gracias. My wife is from Bogota and I would love to buy here some Tamales by mail. We live in St Louis and their are no restaurants here. 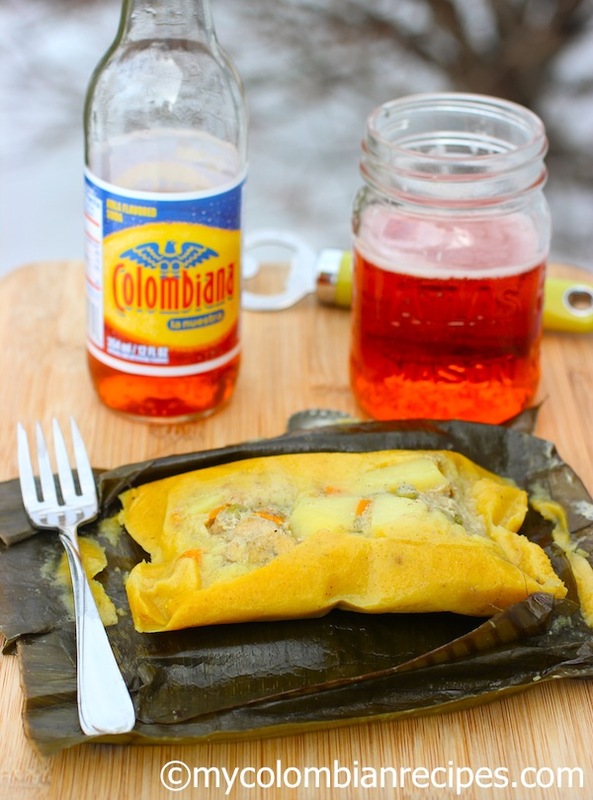 Do you know anyone who ships Colombian Tamales by mail. Robert- I don’t know anyone! Imhope this answer is not getting tomyou too late. 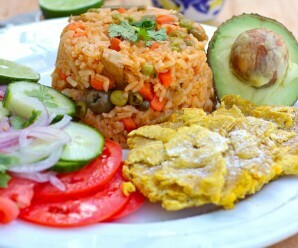 There is a great Colombian company that ships Colombian foods and such in the US. They are out of New Jersey but they ship nationwide now. I order all kinds of stuff to cook Colombian recipes and I’ve been very happy with their service. The nameof the companynis “Productos La Fe”. Google them up and call them. Good luck! Productos La Fe is a Colombian import company out of New Jersey that sells and ships tamales as well as many other Colombian foods and ingredients nationwide. Google La Fe and I’m sure you’ll find them interesting. I’ve been using them for years. Muchas gracias por esta receta! Se ve deli! Te queria preguntar si las carnes se ponen pre cosinadas, o si van crudas? Nunca he hecho tamales, conmo te daras cuenta asi que me quiero asegurar que tengo toda la informacion. Mi esposo me decia que ellos ponian las carnes precocidas, yo segui la receta al pie de la letra y las puse crudas y quedaron perfectos los tamales!! The last time I had tamales was at my aunts house five years ago. They look just like yours! I cant wait to make this for my moms birthday. I dont remember if the masa was all around? Or did it just cover the bottom and the corners on the top only? Can somebody please help. 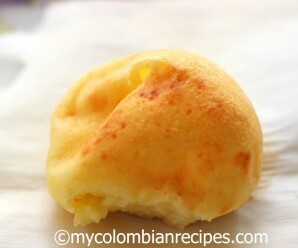 Do you use the masarepa PAN (the white one used for arepas) or do you use the yellow one? By the way, Thank you for this recipe! You can use white or yellow masarepa…..You will be adding color to the masa with the alinos. When you wrapped the tamales like a package the masa will cover all the filling. What can i use in place of the banana leaves? tin foil or parchment paper or both? We made these tamales this past Saturday and to say that they were delicious would be an understatement because they were out of this world. I didn’t use yellow corn meal because I personally think it has a funny, synthetic taste to it, so we made them with PAN white corn meal, and don’t worry, the Sazón Goya will give them the yellow color. We followed this recipe to a T as far as the marinade and filling. Three packets of frozen banana leaves are plenty to make between 12-14 tamales and keep in mind that since they’re very delicate, many of them will be ripped so we had to double wrap them. On top of that, we used aluminum foil to make sure water didn’t get it. We also used our turkey fryer to steam them, put about 4 big balls of aluminum foil with the little leftover banana leaves at the bottom of the pot so that the tamales we put at the bottom didn’t get burned. Filled the pot about 3-4 inches of water and steamed all 14 tamales for 2 hours. PERFECTION!!! Thanks again and again for all your wonderful recipes Erica! Diana-Thank you so much for your feedback! I haven’t had any luck finding yellow, pre-cooked cornmeal. I do, however, have PAN, white cornmeal that I use to make arepas. Is it ok to sub the yellow cornmeal with PAN? Thanks for sharing your recipe! I’m making the tamales on Christmas eve as a surprise for my husband! Another question….. my husband mentioned a while back that they ran fresh cut banana leaves over fire? Do you recommend that we do that or is washing them in hot water enough? He is from Colombia and my family is from México and this is my first attempt at these tamales. Thank you. Elizabeth- I wash them really good with hot water. Thank you so much again!!! I made the tamales on Saturday as a surprise and my husband loved them!!!! Now I have to make the tamales Tolimenses! Hi Erica, thanks for the simplicity with which you present this otherwise complex recipe. I’ve always been somewhat intimidated to tackle these tamales, but I think I will give it a whirl now. Thank you. I would only add that in your instructions, you didn’t mention that the tamales should not be boiled in the water. I don’t think that’s clear. If people boil them in water, it’ll be a big mess because the dough will leak through the leaves and spill into the water. Tamales have to be steamed on top of the water. Conny- I don’t steam my tamales,I cook the in water. Conny in Colombia we boil our tamales, my Mon used to cook it for Noche Buena (Christmas Eve) and She always boiled. You need to make sure the tamales are well wrapped and tied. Hi Erika!! Thanks for the tamales recipe!! My mom used to made for Christmas eve and always were delicious. She used pork and chicken. My mom cooked tamales in water, not steamed. I am making tamales right now. I found fresh cut banana leaves and the ready to use MASA at a latin super market in Atlanta. I am steaming them , because I don’t like to boil them , the water gets kind of greasy. 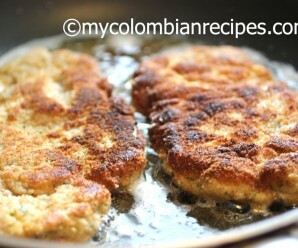 Estoy feliz de haber encontrado esta pagina con recetas de mi querida Colombia. Felicitaciones Erica a ti y a tu madre. 1. I don’t cook the meat before. 2. Sometimes I use wax paper or foil to wrap them. 3. I cook them in salted boiling water. I have frozen the tamales – any tips for how to re-heat? I have avoided making tamales and arepas for my family the past few yrs because we avoid all products containing GMOs. All masarepa is made from Genetically Modified corn here in the US that is exported to South America. I am happy to report that I have finally found a way to make organic masarepa!!! You can find hard organic corn at most health food stores. I have also used Bob’s Red Mill Bobs Red Mill Masa Harina which comes very close, but the link above is by far the closest thing I have found. My mother-in-law says this is the way they made it when she was a girl growing up in the mountains in LaMerced. Do you cook the tamales inside of the water or only with the vapor? Really looking forward to make them… YUM! I cook them inside salted boiling water. Erica, donde consigues las hojas de banana en USA? walmart? En mi supermercado. Marca Goya. Is there any way you could make these tamales ahead of time and just reheat them? If so, what’s the best way to reheat – steam again, oven, microwave? Me considero paisa, soy Risaraldense! Vivo en US. Y como tú, disfruto del placer de nuestra variada gastronomía colombiana justo aquí en casa, lo más parecido posible. Gracias por tu aporte, tus recetas me sirven mucho de base. Quería preguntarte: Será que se puede cocinar la carne cruda dentro del tamal? Es decir, no hay necesidad de precocinar? Espero tu respuesta, gracias! No, yo la pongo cruda. Can you give some tips to keep tamales in good condition to everyone? I think it is a good idea to improve your post. I love Colombian tamales! One of my best friends is from Colombia and he used to cook them for us. I should ask them to him again! First of all, thank you so much for sharing all these amazing recipes! Love them! this is my go-to website for Colombian recipes. Today I’m finally being brave enough to take on this tamales recipe. I love tamales, but the ones I find here in SoCal are only Mexican tamales which are totally different to ours. Wish me luck, I’ll let you know how they turn out! Looks fabulous! If I were to substitute chicken for the pork, do you have recommendations on which cuts and how much? I am confused about using cut pork ribs if I should ever make those…and leaving the bone in during the prep? I don’t follow…I am somewhat of a cooking novice, but I am stumped as to leaving bone in while preparing these.